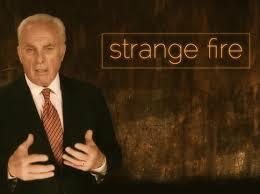 I appreciate John MacArthur’s concern over the abuses and perversions in the pentecostal/charismatic churches. I agree with him that much of this stream of Christianity has gone astray, but I don’t believe that the use of certain gifts is what breaks God’s heart. I believe what breaks God’s heart is our spiritual adultery. The disobedience of Nadab and Abihu was a result of their adulterous actions. God struck them because they were corrupting the message of grace–not because they were using the wrong gifts. Leviticus 9 is about blood sacrifice. Ultimately it points to Jesus, the Lamb of God who takes away the sins of the world. After the blood was shed and placed on and before the altar the sacrifice was consumed by fire and the people saw the glory of the Lord and his presence was with them. By offering incense to the Lord, Nahab and Abihu were trying to please God and give him an even more precious offering than what God had required. They had just seen him consume the offering on the altar with fire and the glory of the Lord had appeared, causing the people to bow in worship. They were probably caught up in this miraculous and majestic display and wanted to give an offering that was even more special to God. This is adultery to God. Even though it may seem like giving something more precious and sweet to God would be pleasing to him, it is actually an anathema. The only thing that pleases God is the Son. That’s because he is the Lamb whose precious blood was shed. When we add to the blood, we are adding our own effort, wealth, or spiritual offerings to the WAY God has established. Jesus fulfilled the Old Testament law by becoming the Lamb of God whose precious blood would be sprinkled on the altar (Hebrews 9-10). If we add to the blood, then we are no longer equal at the foot of the cross. Some, who are in positions of authority or service, such as Nadab and Abihu, could offer more. Some, who are wealthy or particularly gifted, could offer more, but God made it clear–it’s the blood, and the blood alone, which is pleasing to him. Jesus brought us grace and truth (John 1:17) and we can’t add to either of these without being in danger of offering strange fire to God. When we add to the Bible, through dreams, visions, prophetic utterances, interpretations of tongues, journaling, and even by blending in philosophy, science, or even Old Testament laws, we are in danger of corrupting the TRUTH and committing spiritual adultery. If our extrabiblical revelations take us away from the truth of the Word (such as Joseph Smith’s revelation of the golden plates or Rick Joyner’s vision of the “final quest”) then we are adulterers. Nadab and Abihu didn’t obey the word of the Lord–they added to his command–and it displeased God. When we add to grace by teaching that our lengthy prayers will gain God’s attention, or spiritual activities such as worship, lighting candles, walking labyrinths or pathways, swinging incense, etc . . . will bring us into the presence of God, then we are guilty of offering strange fire. When the church adds vain repetitions and mystical experiences to the precious blood of Christ in order to draw near to God, they are committing spiritual adultery! Nadab and Abihu added an offering of incense to the blood offering and it displeased God. If our spiritual “gifts” are being used in a way that takes us away from the word of truth or the grace of God then we are spiritual adulterers and we are offering strange fire. It’s not about the gifts–it’s about grace. Yes, the gifts can be abused, but the gifts can also bless. It’s how we use our gifts that matters to God. Are we using them to add to and corrupt the truth–or to spread the truth? Are we using them to add to the work of the blood of Jesus that was finished at the cross–or to give glory to the blood of Jesus? So much of the charismatic/pentecostal movement has committed spiritual adultery, and this is what I believe John MacArthur is lamenting about–after all, where does it say anywhere in the Bible that those who are administering healing should kick, punch, or injure those who need to be healed? Todd Bentley said God told him to do this in a voice in his mind, but it isn’t found in the Word. Bentley was adding to the Word, and I believe he was committing spiritual adultery when he did this. Much of the modern church has gone astray and committed spiritual adultery. I outline this in further detail here, but I don’t believe the crux of the argument is about whether the gifts have ceased or continued. I believe the argument needs to be over how we use our gifts. Are we using them in purity, with our whole emphasis being on preserving grace and truth, or are we using them in unholy, adulterous ways that abandon the truth and grace of the blood of the Lamb?